Somewhere a couple of weeks back, I got my week numbers a bit twisted. So this week I’m just going to omit them completely until I can get it straightened out for next week’s forecast. I apologize for the mistake and hope you forgive me! 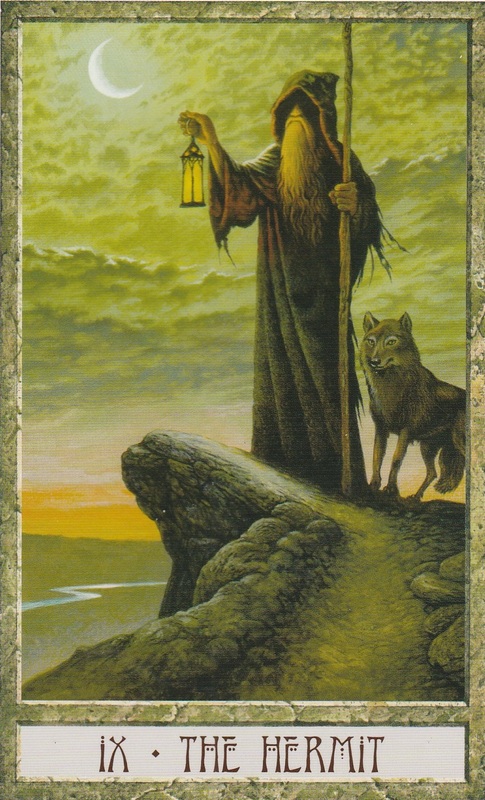 The card for this week is the Hermit. The Hermit appears when you are asked to use your knowledge to illuminate the world. With all the swords energy in the air this week, you may be called upon to use your wit and intellect to shine light on a foggy situations. People may turn to you and you may realize, for the first time, how respected you really are. Mantra: Wisdom is a gift to be shared. 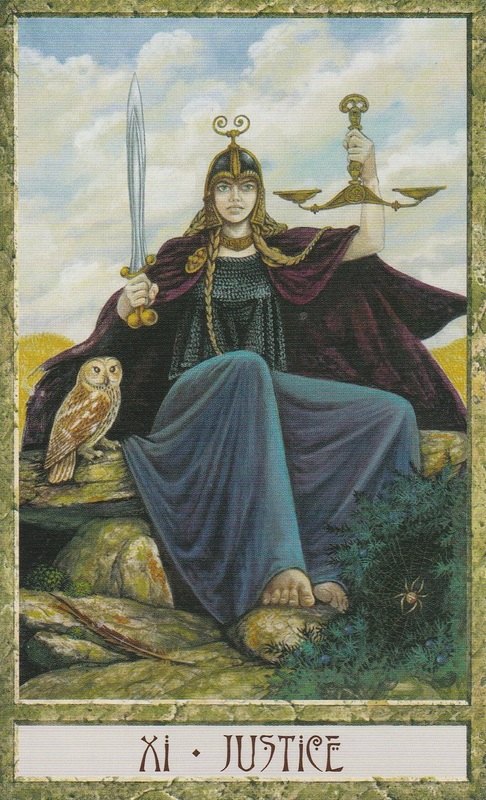 The Justice card appears when fair judgement will be passed and the players in the situation will get what’s coming to them. Speak the truth and it will bode favorably for you. But if you’ve been less than honest, the outcome may not be in your best interest. This card also appears when legal matters may come up so be careful. Moon sextile Neptune at 11:08 PM PST will up your intuition and also help you show compassion, especially towards those that have harmed you. The Moon is in Taurus, the sign of love and beauty today, ensuring you that things are how they should be. The number of the day is 8, a number of karma. Mantra: Justice is not blind. 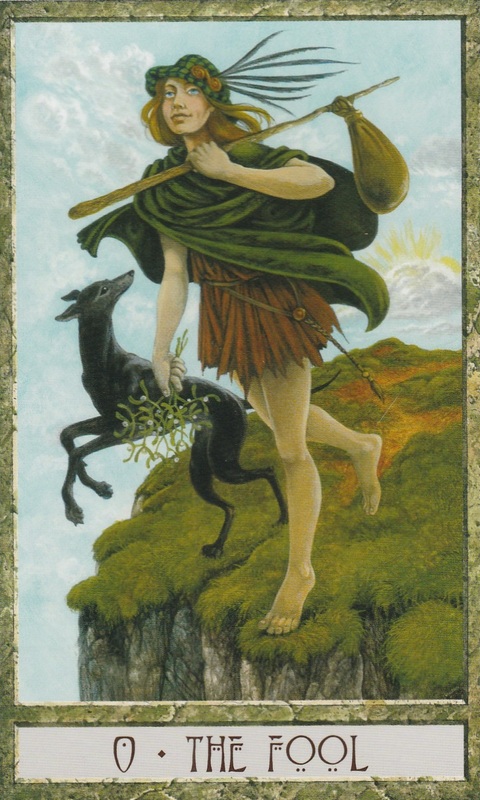 The Fool appears when a new beginning is right around the corner. This is a time when you’re asked to take a big leap of faith and trust that the journey you’re embarking on will be a successful one. Make sure you pay attention to the details but don’t let fears and doubts hold you back. Moon trine Mars at 5:39 AM PST will give you the strength and courage to let go and free fall into the future. Moon trine Pluto at 7:46 AM PST will plunge you into the depths of your feelings but there is much to be learned there. The Moon is void of course in Taurus from 7:46 AM PST so this is a day to prepare but with hold from action if possible.The number of the day is 9, a number asking you to wrap up the past, leave it behind and move forward toward new aspirations. Mantra: Take a breath before you fly. 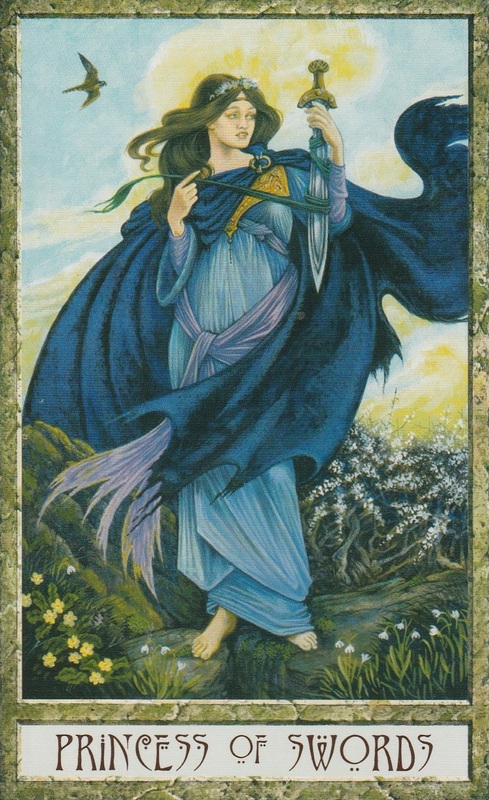 The Queen of Swords represents traditionally feminine logic. She is a woman of the mind who can outwit anyone with her intellect. If she does not represent you, she may represent someone you come into contact with today. Venus enter Sagittarius at 12:01 AM PST where she will stay until 12/11/16. While Venus is in Sagittarius, people thirst for knowledge. It’s a fun, flirty time where you will want to live life to the fullest. The only problem is that because everything seems so interesting, it may be difficult to focus. Moon opposition Venus at at 8:09 AM PST could bring intensity to relationships. If there’s any sort of conflict brewing, it’s best to get everything out in the open before it explodes but do it in a logic manner. But for the most part, this is a positive transit. Moon trine Jupiter at 9:11 PM PST will bring optimism to your night. Moon square Neptune at 10:47 PM PST could cloud your intuition. It’s best to turn in for bed early before you find yourself feeling confused. The Moon is in the duality based sign of Gemini for most of the day, reminding us that it is best to cultivate a balance between your head and heart. The number of the day is 1(0) a number of new beginnings. 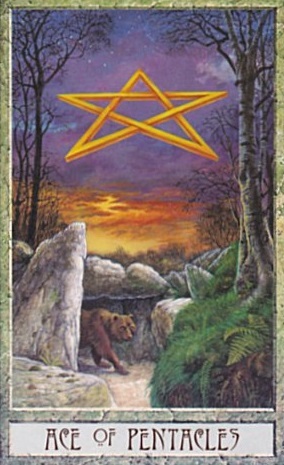 The Ace of Pentacles appears when there is about to be a new beginning in abundance. 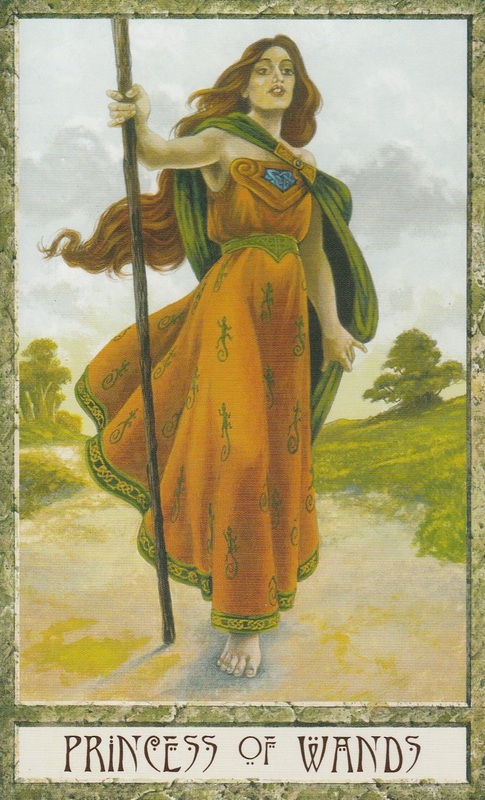 Traditionally, the card depicts a floating hand holding a pentacle in the sky overhead. You are being offered the chance to bring more prosperity into your life. But the choice is yours whether you take it or not. Mars conjunct Pluto at 4:18 AM PST may leave you feeling power thirsty. Channel that energy into going after you want with the mindset to win. Luckily, this transit also brings the power to persuade others to your join your cause. If this transit’s energy goes unfocused it could lead to violence. Moon opposition Saturn at 4:40 AM PST could bring conflicts between you and the people you care about. You may feel sour all around and not want anything to do with anything. However, know that these feelings are fleeting and that you are just in a bad mood. Moon trine Mercury at 6:59 PM PST will bring flowing communication. Conversations at this time have the potential to be filled with wit, intellect and creativity. Moon sextile Uranus at 7:41 PM PST could bring new and exciting experiences. Be ready for them. The Moon is in the chatty sign of Gemini today, reminding us that the root to solving problems is communication. The number of the day is 2, a number of balance. Mantra: The pen is mightier than the sword. The Princess or Page of Wands appears when passion has been suddenly ignited but the flame hasn’t been burning for very long. You may feel suddenly inspired to try something new but be careful because you may not understand the power you hold. the flame is in danger of fizzling out. Venus opposition Neptune at 12:48 AM PST could bring confusion. But if you take a step back and look at the big picture, everything will become apparently clear. If you are asleep during this transit, this theme may appear in your dreams. Moon trine Sun at 4:16 AM PST brings happiness, harmony and flow to your day. Moon square Jupiter at 11:41 PM PST will end the evening on a positive note but watch your ego. The Moon is in the emotional sign of Cancer for a good chunk of the day so keep your temper under wraps if provoked. The number for the day is 3, a number of things coming together. Mantra: Every flame starts with a spark. 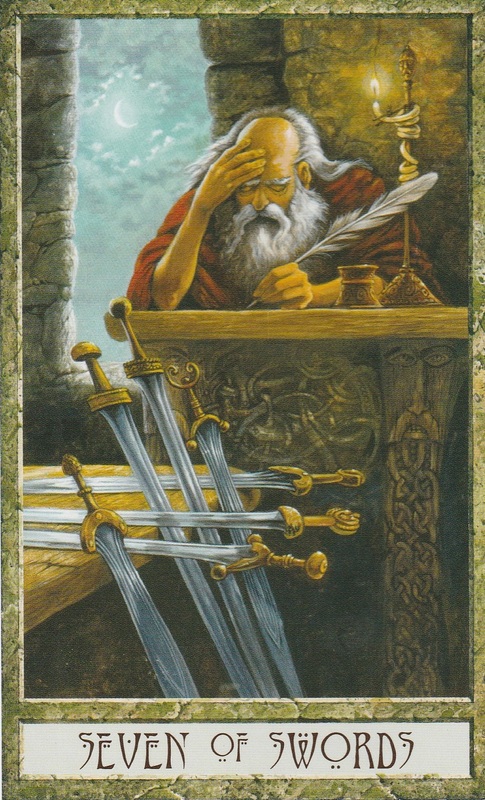 The 7 of Swords is a card of theft and deception. Be on your guard because this card indicates someone who is so sneaky, he or she may steal something important for you right from underneath your nose. But overconfidence often leads to folly and the thief will get what is coming in the long run. Moon trine Neptune at 12:34 AM PST will heighten your intuition and help you get a good idea who to watch out for. Moon opposition Pluto at 10:13 AM PST may find you confronting someone who is trying to get the best of you. Hidden thoughts and deep secrets may be revealed. Moon opposition Mars at 1:04 PM PST could find you feeling pugnacious and irritable. Try to remain calm in the face of looming conflicts. Moon square Uranus at 10:44 PM PST may stir up a rebellious streak. You might feel restless but avoid jumping to conclusions if faced with a situation in which you don’t have all the facts. The Moon is in the emotional sign of Cancer today, so encounters could be charged and reactions may be over the top. The number of the day is 4, a number that reminds us that even if we have to confront someone, getting the issue out in the open and forming boundaries now will lead to stability in the future. 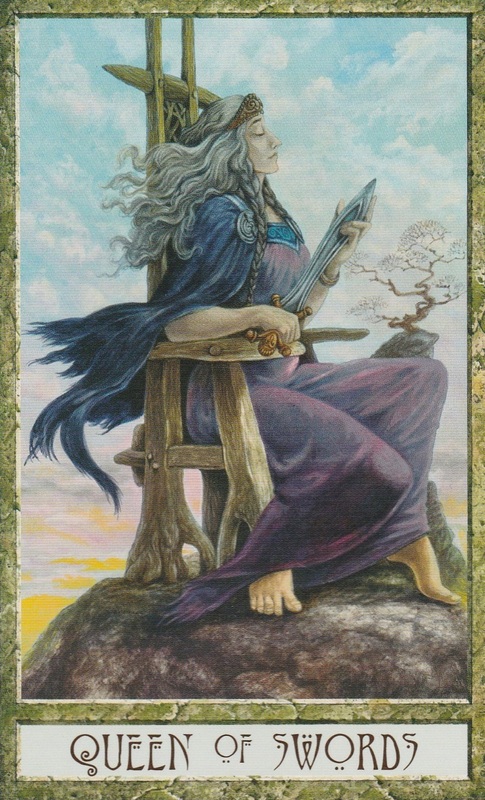 The Princess or Page of Swords is traditionally a young person who is very enthusiastic about matters of the mind. He or she has a gift with words but sometimes can fly off the handle due to immaturity. If this card doesn’t refer to you, it could refer to someone you come in contact with today. Moon square Mercury at 5:30 AM PST can muddle communication. Moon square Sun will bring to light insights from the lunar cycle that is now coming to a close. The Sun enters the volatile sign of Scorpio today where He will stay until 11/21/16. When the Sun is in Scorpio, people may be more passionate than usual. But they will also cloak themselves in mystery. Dot your I’s and cross your T’s because this sign is infamous for making people touchy. Moon trice Venus at 11:28 PM PST will bring happiness, harmony love and beauty to your late night. It’s last quarter in Cancer so look back at how you felt emotionally during this lunar cycle for clues as to what intentions you should set for the next cycle. The number of the day is 5, a number of overcoming hardships. Mantra: I am in control of my thoughts and feelings. This entry was posted in art, Books, dreams, mysticism, mythology, numerology, occult, self help, spirituality, Tarot, Uncategorized, witchy, Writing and tagged abundance, astrology, card a day, divination, dreams, empowerment, inspirational, magick, manifestation, mantra, meditation, metaphysical, motivational, mysticism, numerology, occult, pagan, predictions, psychic, self empowerment, self help, spiritual, spirituality, tarot, tarot reading, tarot weekly forecast, wicca, witchcraft, witchy, writing. Bookmark the permalink.